We covered desert for you but I think it would be irresponsible of us not give you babes a great cocktail recipe to have in your repertoire. I originally came across this recipe on Half Baked Harvest and it looked so delicious I had it give it a try. Her original recipe was killer but me being me I had tweak it a bit and add a little more spice with some ginger and orange bitters. 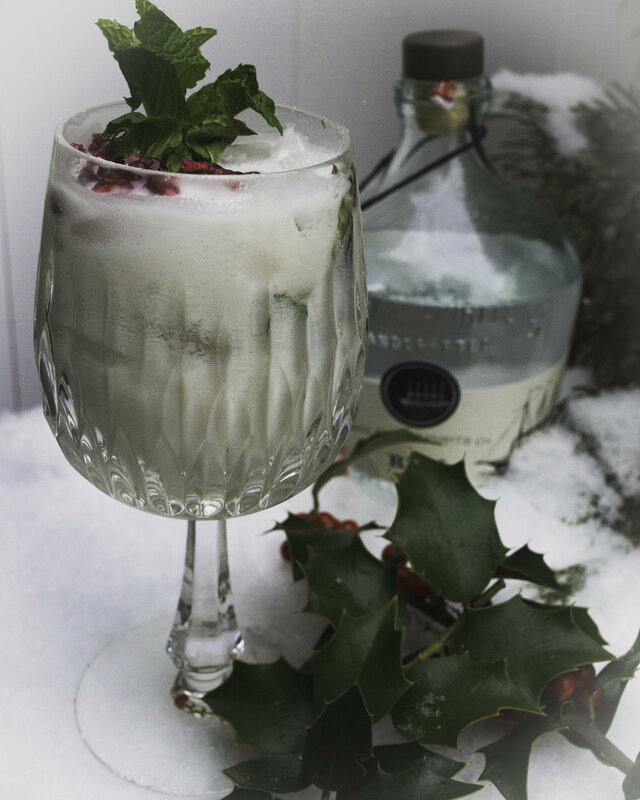 So babes I give to you the white winter mojito…..It taste like summer but looks like winter. The aesthetic matches the landscape but the flavors will transport you somewhere a bit more tropical. Exhibit picture right: totally vibing on the snowstorm whilst drumming up ideas for a winter escape. The conclusion, Anna and I are currently researching surf retreats for an early March get away. We are taking suggestions if any of you babes know of great surf retreats. The white winter mojito is easily made into a mocktail just leave out the booze and replace with extra sparkling water! Bring ginger, sugar, and water to a simmer in a small heavy saucepan over medium-low heat, stirring until sugar has dissolved, then gently simmer, uncovered, 30 minutes. Strain through a sieve and reserve ginger for another use, then cool to room temperature. This yields about a cup of simple, which will keep for a about two weeks if stored in the fridge. In a glass, muddle the lime, sugar, simple syrup, ginger juice and mint leaves until the leaves have broken down. Fill the glass half way with ice. In a shaker, combine the white rum, coconut rum, and coconut milk and shake until smooth. Pour over the ice and stir to combine. Top with sparkling water, pomegranate and candied ginger. Note: coconut milk tends to be separated when you open up a fresh can. The thick cream hardens at the top of the can and the lighter liquid remains at the bottom. This is even more pronounced if you use regular coconut milk rather then the light. I always blend my coconut milk prior to use in order to get the best consistency.